This page outlines a process to link skilled volunteers with the need of the social service community. This is a pilot project of the Life Solutions Network and Volunteer NKY. 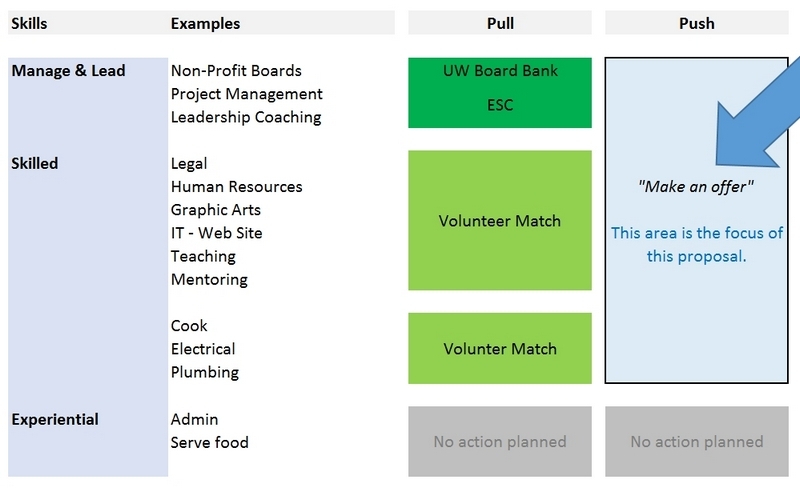 The current main process to leverage skilled volunteers is a pull-type process. In this model an organization communicates a need and shares it, e.g. through Volunteer Match or United Way via Board Bank. Many volunteers are unclear on how to serve to their potential using their talents. Some want to demonstrate a “resume-building volunteer experience”. Our Plan: Create a push-based process to enable individuals to make an offer on how they want to use their talents in Northern Kentucky. Help individuals understand the push/pull options and their goals. The potential volunteer submits a proposal using the template (see separate document, available upon request). A sponsor is assigned. Initially this is Tony Aloise but others will be sponsors as the program grows. The sponsor makes a few direct connections (with Friends of the Life Solutions Network). If after two weeks, nothing is defined then communicate broadly to the Safety Net Alliance of NKY (via a SNA alert, eventually, we need to create a web page to post the offers). Maintain bi-weekly communication with the potential volunteer until an assignment is agreed-upon. Design a process for ongoing hiring of staff (or volunteers). Evaluate and improve or implement a personal development process. Provide training to staff on how to screen and interview volunteers. We will work with you to develop your proposal. Begin some limited pilots to further learn and define the process and the need. Contact us if you want to participate in this pilot. Further engage United Way and others to avoid overlap with existing processes.